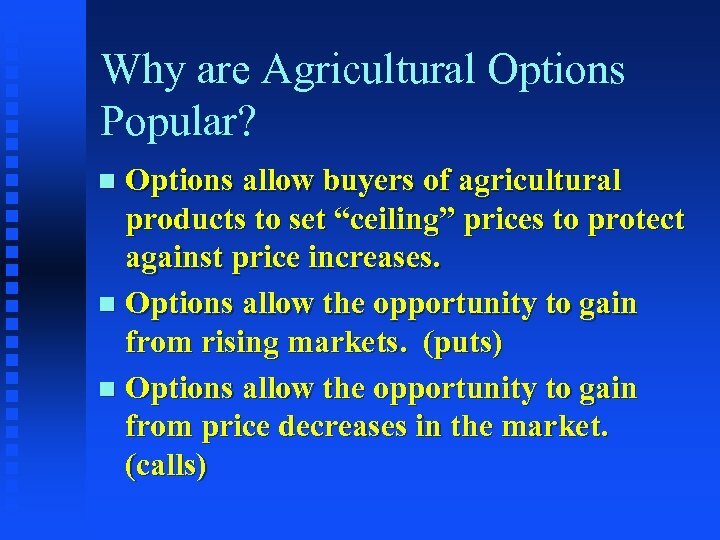 Why are Agricultural Options Popular? 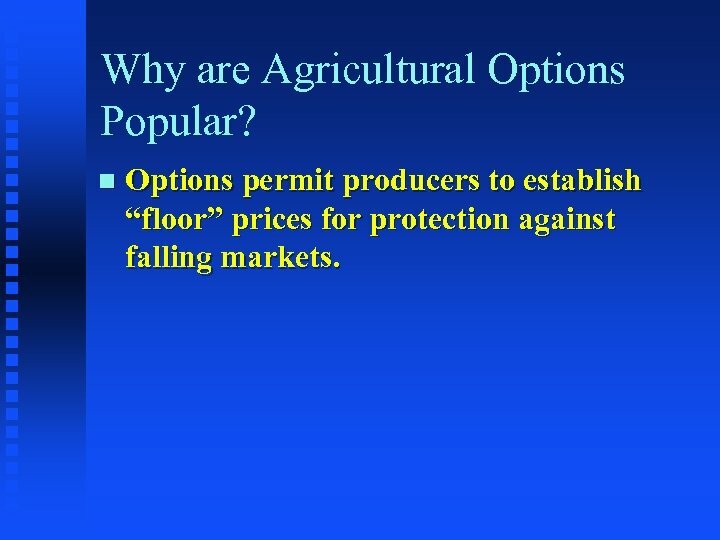 n Options permit producers to establish “floor” prices for protection against falling markets. 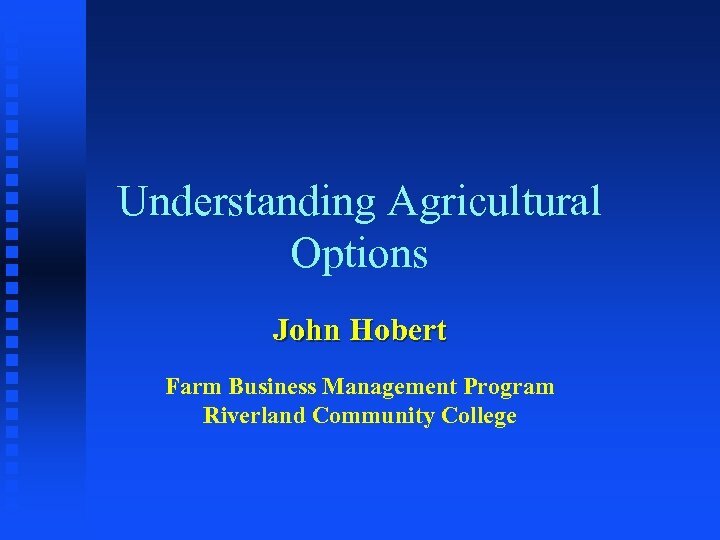 What is an Option? 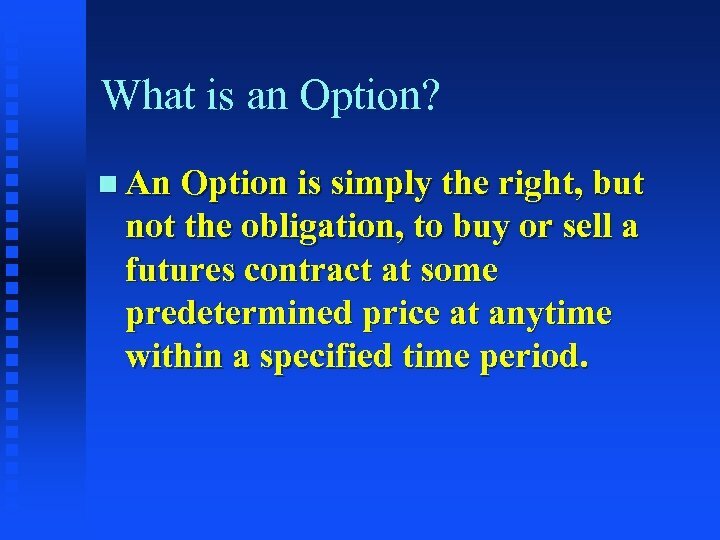 n An Option is simply the right, but not the obligation, to buy or sell a futures contract at some predetermined price at anytime within a specified time period. 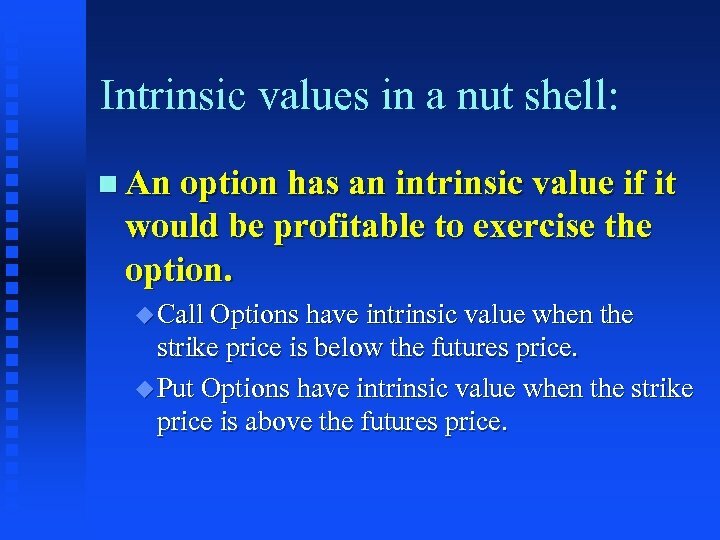 Intrinsic values in a nut shell: n An option has an intrinsic value if it would be profitable to exercise the option. 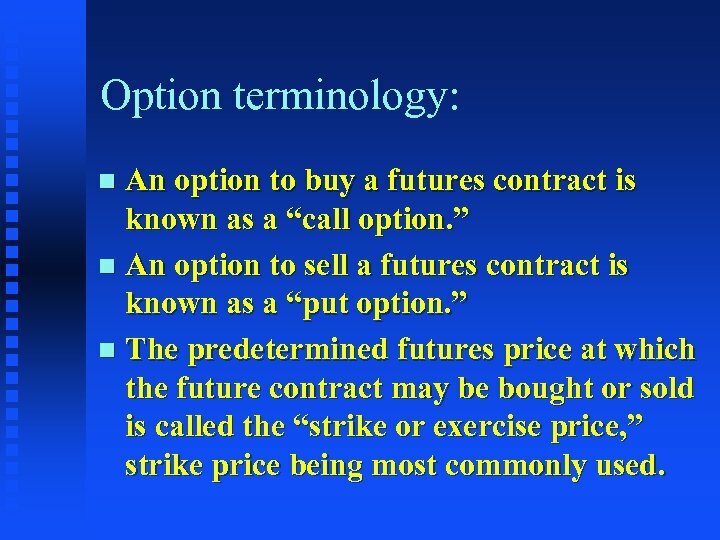 u Call Options have intrinsic value when the strike price is below the futures price. 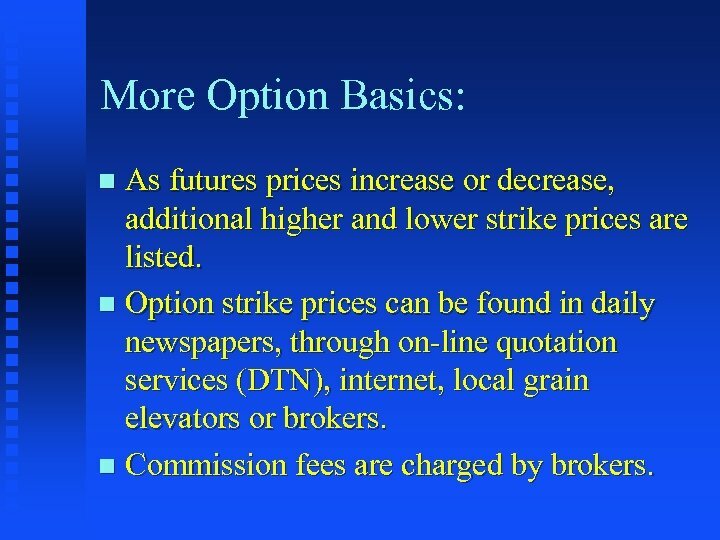 u Put Options have intrinsic value when the strike price is above the futures price. 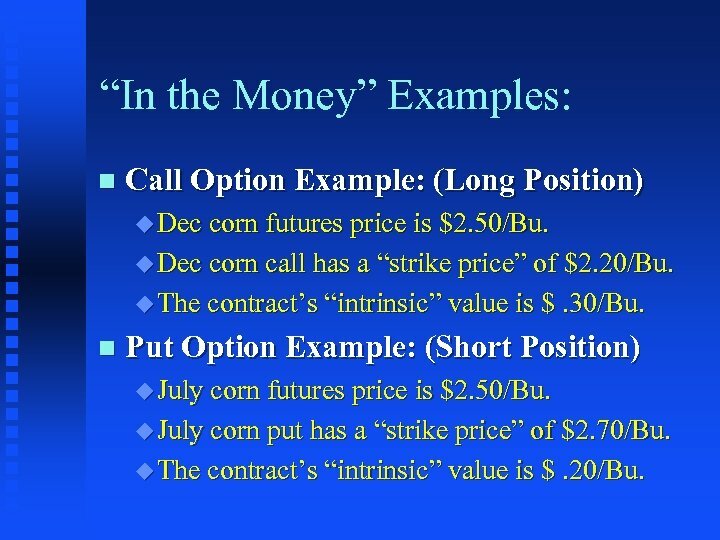 “In the Money” Examples: n Call Option Example: (Long Position) u Dec corn futures price is $2. 50/Bu. 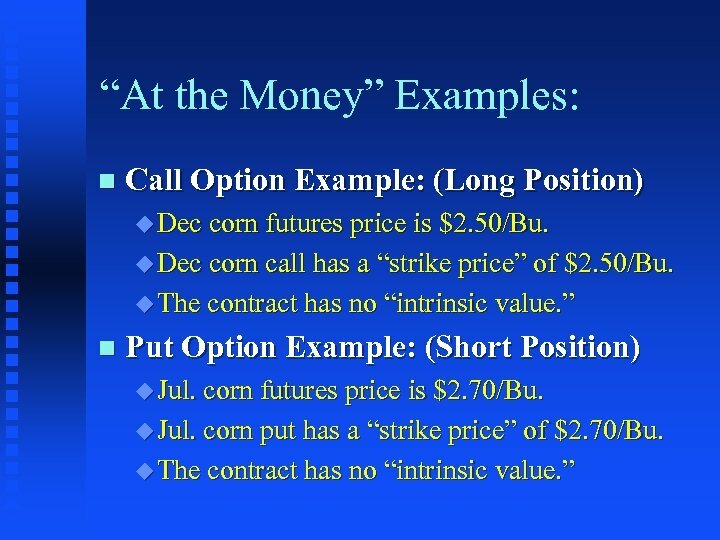 u Dec corn call has a “strike price” of $2. 20/Bu. 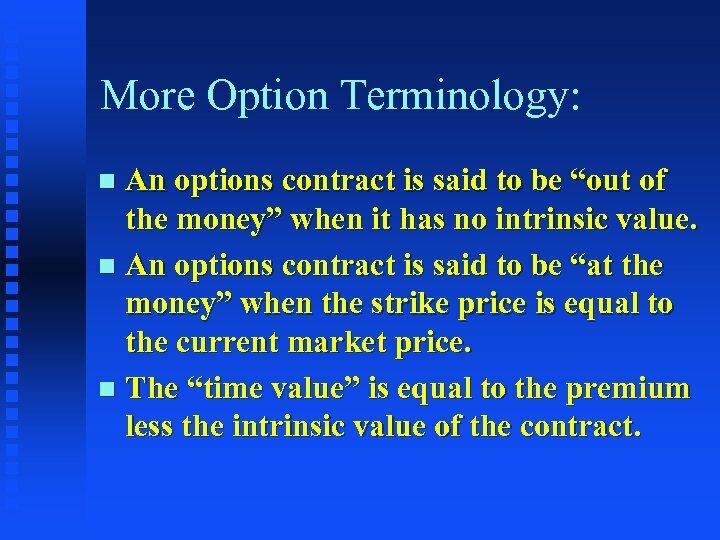 u The contract’s “intrinsic” value is $. 30/Bu. n Put Option Example: (Short Position) u July corn futures price is $2. 50/Bu. 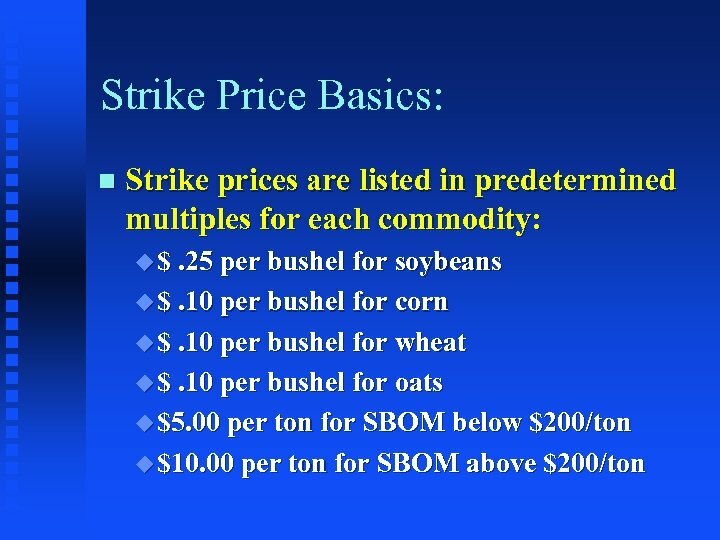 u July corn put has a “strike price” of $2. 70/Bu. u The contract’s “intrinsic” value is $. 20/Bu. 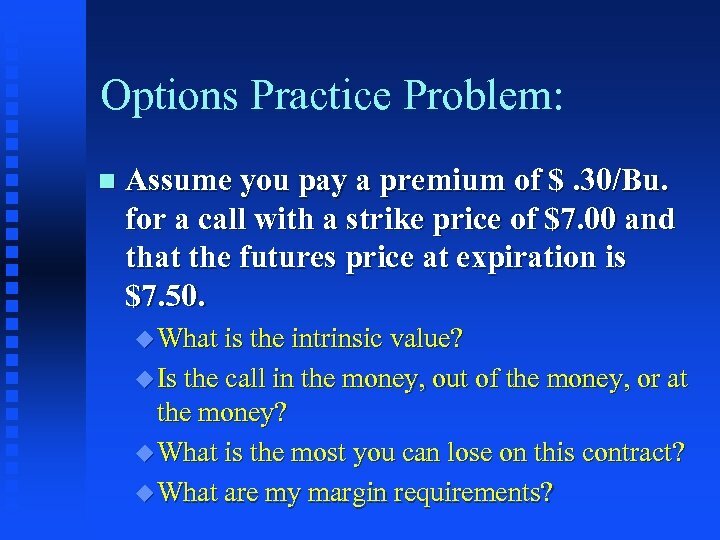 Options Practice Problem: n Assume you pay a premium of $. 30/Bu. 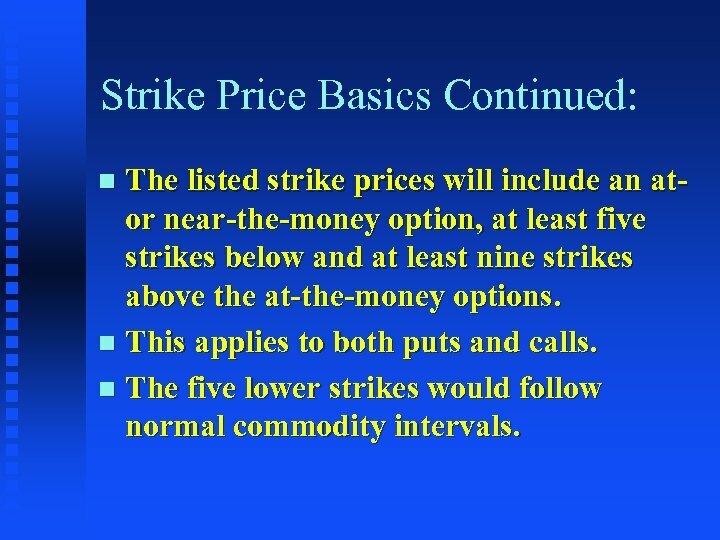 for a call with a strike price of $7. 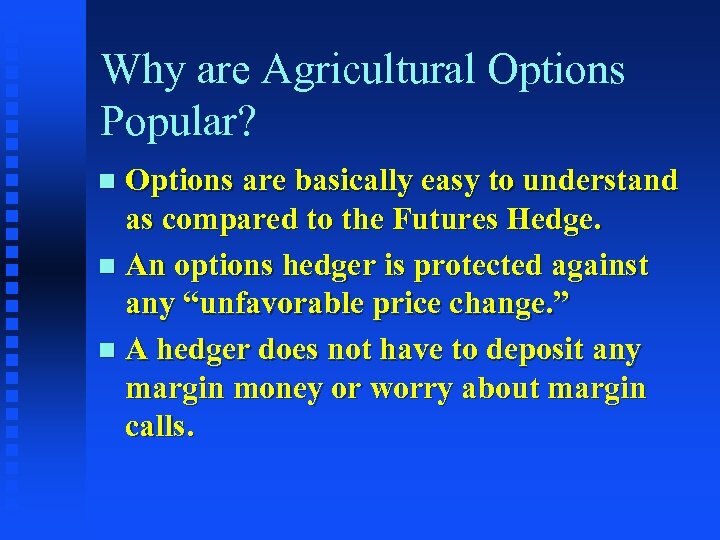 00 and that the futures price at expiration is $7. 50. u What is the intrinsic value? u Is the call in the money, out of the money, or at the money? 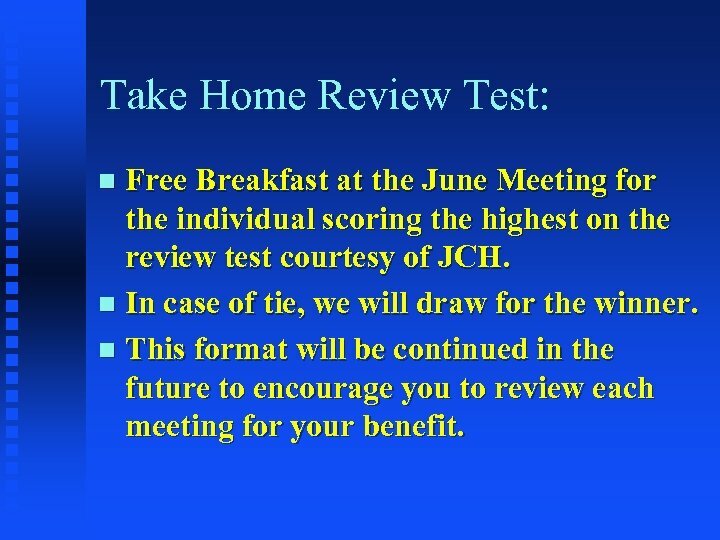 u What is the most you can lose on this contract? u What are my margin requirements? 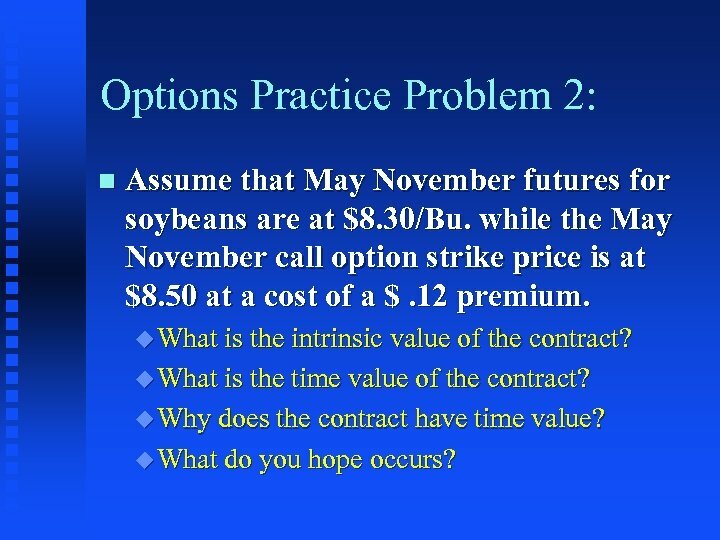 Options Practice Problem 2: n Assume that May November futures for soybeans are at $8. 30/Bu. 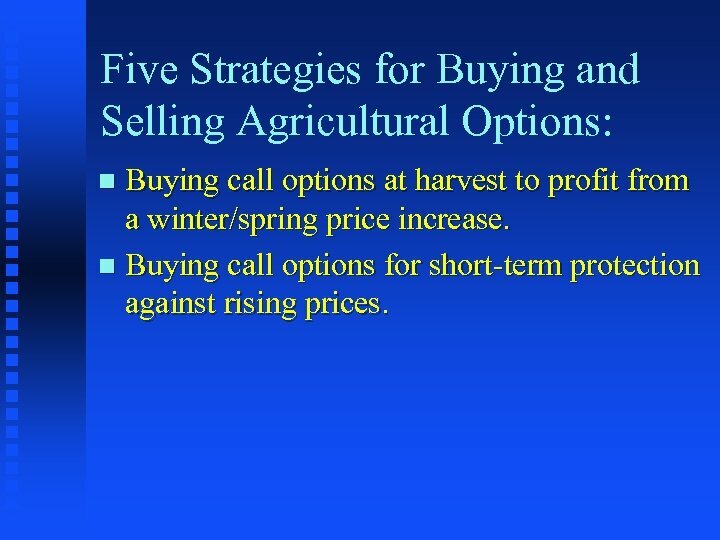 while the May November call option strike price is at $8. 50 at a cost of a $. 12 premium. u What is the intrinsic value of the contract? u What is the time value of the contract? u Why does the contract have time value? u What do you hope occurs? 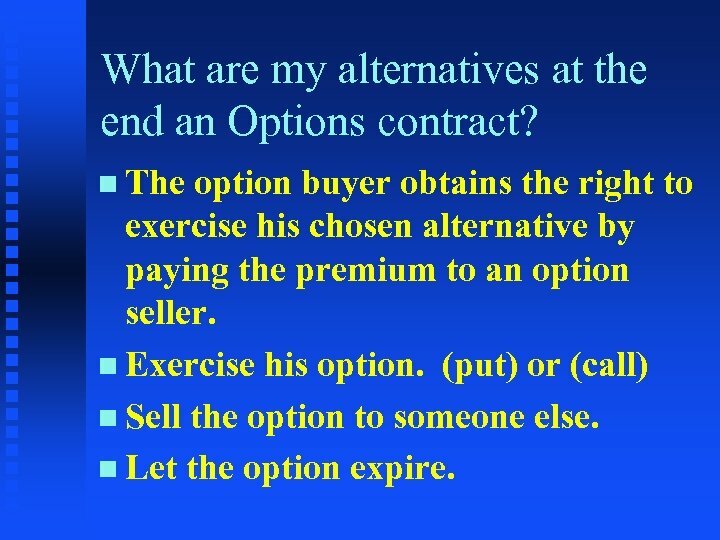 What are my alternatives at the end an Options contract? 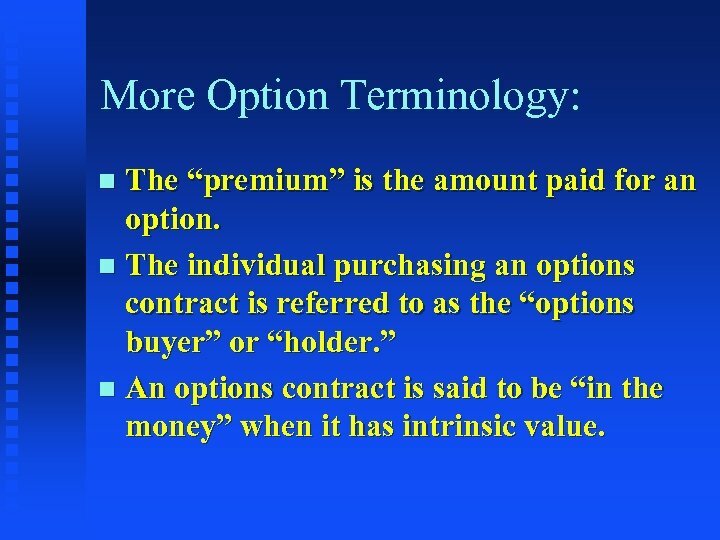 n The option buyer obtains the right to exercise his chosen alternative by paying the premium to an option seller. 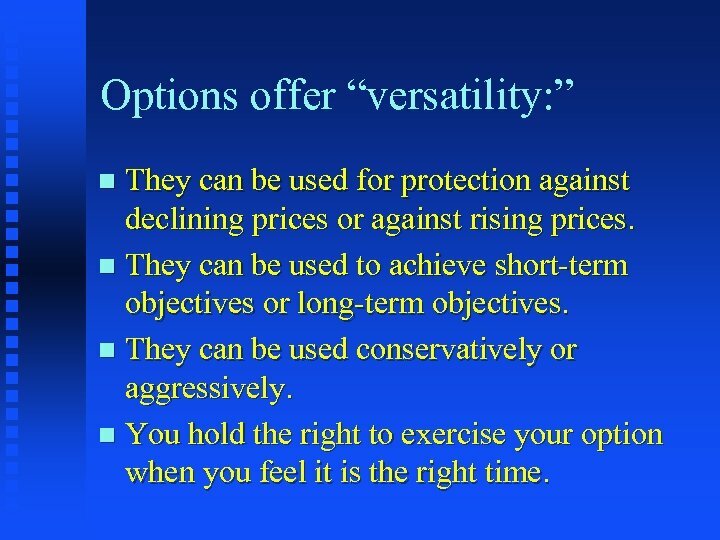 n Exercise his option. 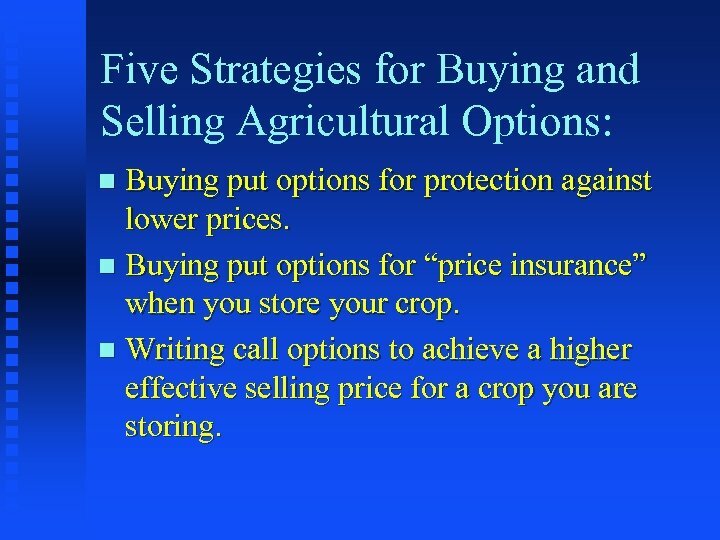 (put) or (call) n Sell the option to someone else. 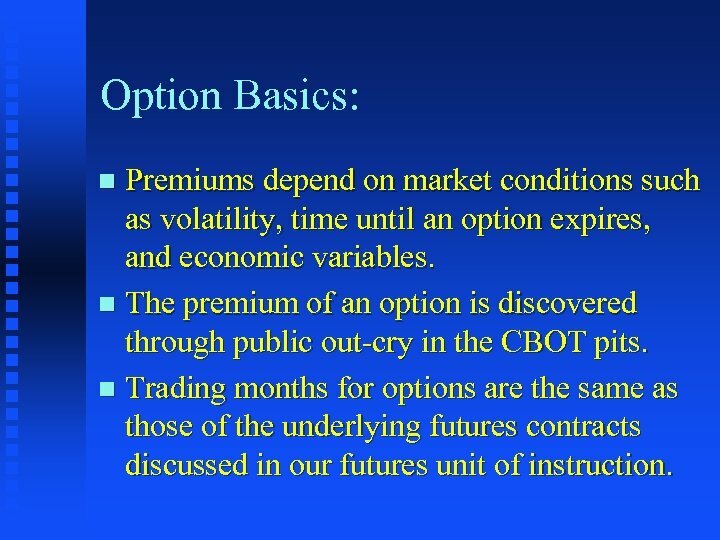 n Let the option expire. 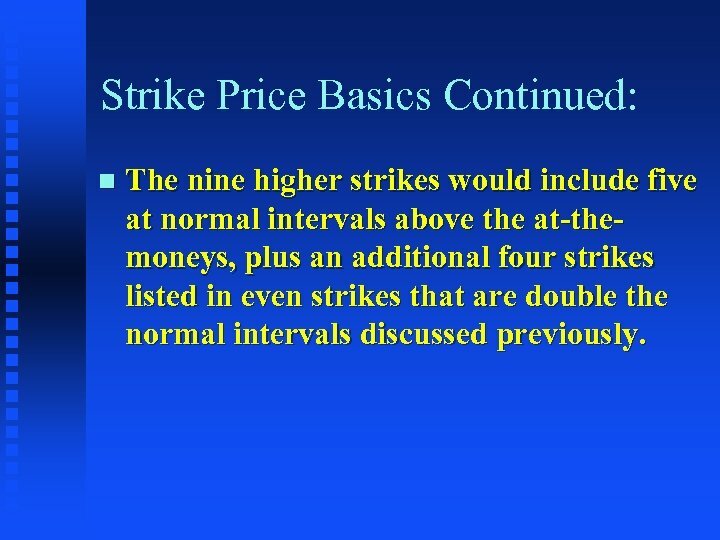 Strike Price Basics Continued: n The nine higher strikes would include five at normal intervals above the at-themoneys, plus an additional four strikes listed in even strikes that are double the normal intervals discussed previously. 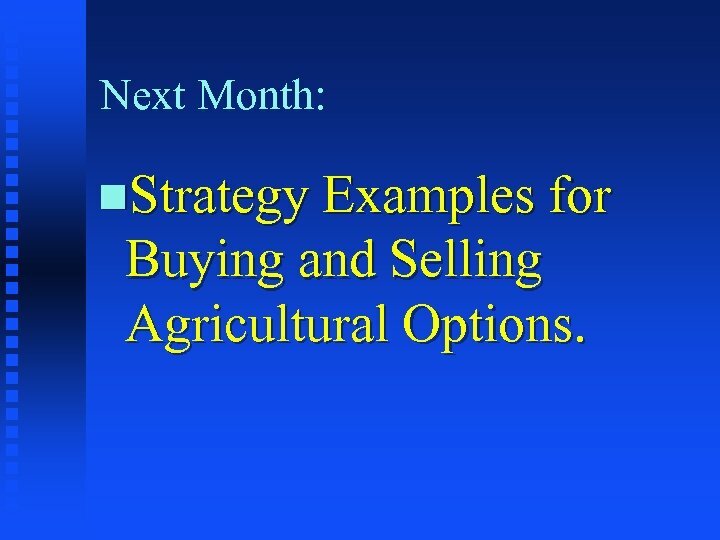 Next Month: n. Strategy Examples for Buying and Selling Agricultural Options.